After being named one of Australia’s Most Innovative Engineers in 2018, Neil Mackenzie has launched himself into an exciting new role with Mott MacDonald. Mackenzie made the annual Most Innovative Engineers list for his development of novel loudspeakers for Brisbane’s Queen Elizabeth II Courts of Law. He developed the loudspeaker from initial concept to seeing more than 400 of them installed in the floor of the law courts, much of it in his own time. For Mackenzie, innovation is all about challenging yourself and taking risks. “If you don’t challenge and fail, then you won’t learn,” he said. 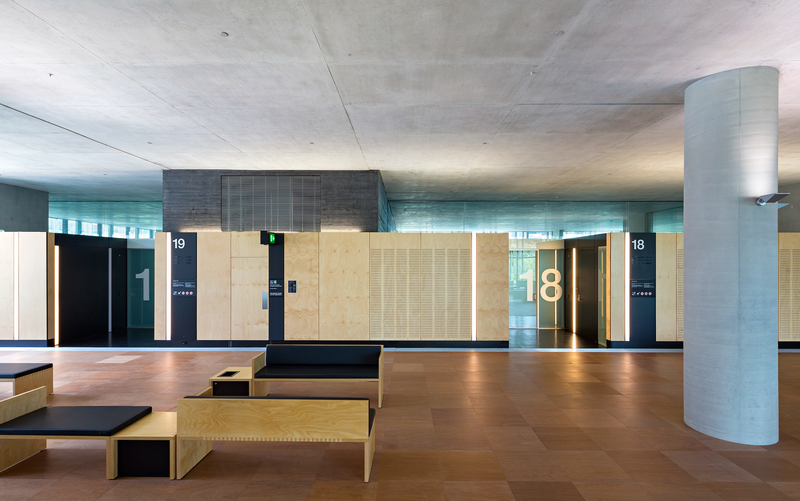 The law courts were designed using a palette of few materials: concrete, timber and glass – all of which reflect sound. This made the task of controlling acoustics within spaces critical for speech intelligibility very challenging. Mackenzie’s solution was to mount loudspeakers in the floor to provide a low level of sound reinforcement. They need to be extremely robust given the potential exposure to liquids, dust and impacts. Inside the Queen Elizabeth II Courts of Law. The design was essentially a flat board with a transducer bonded to the rear. This transducer imparts bending waves in the plate which then radiates sound (conventional loudspeakers use oscillating cones to displace air generating sound). The type and size of plate, the edge support of the plate and location of transducers on the plate all contribute to the quality and intensity of sound generated. Mackenzie’s new role at Mott MacDonald sees him challenged with developing an Australia-wide sciences team for the global firm. He wants to bring his skills in wind engineering, acoustics and audio-visual applications to clients across Asia and New Zealand, and continue working in digital technology, parametric modelling and coding. The loudspeaker technology is still in the mix too, with Mackenzie excited about the opportunity to use it on other projects around the world. Another project Mackenzie is looking forward to is the development of smart infrastructure technology stemming from his work with Aurecon on telecommunications towers for mobile phones. 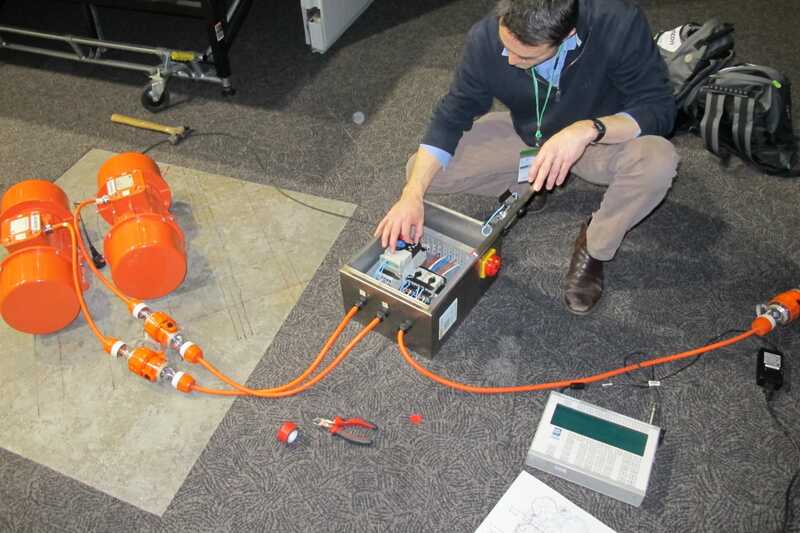 The job involved wind tunnel testing on a head frame and the development of a ‘digital twin’ — a digital model to help the client understand the utilisation and the capacity of the poles. Mackenzie later came up with the idea of adding instrumentation to the actual poles, so the client could understand their performance in real time as well as in the laboratory. Now he wants to develop the technology further to monitor infrastructure assets, such as bridges and underground pipes, and provide feedback on their condition. Mackenzie believes innovation isn’t something that happens in isolation. He said the loudspeaker innovation came from being challenged by an architect who wanted a particular aesthetic within the space. “The challenge laid down by my client created a collaborative environment through which we came up with this idea of putting loudspeakers in the floor and what that would mean for the loudspeaker design,” Mackenzie said. Mackenzie also plans to enter this year’s award with an innovation he worked on at Aurecon for the Adelaide Convention Centre redevelopment. As part of the project, Mackenzie was challenged to determine the life of bearings isolating the new Plenary Hall. Dr Neil Mackenzie assessing bearings at Adelaide Convention Centre. He used low-cost industrial shakers driven in opposite phase to impart a known force onto the existing structure, determining the response of the bearings to a given force and any change in the stiffness of the bearings over time. Nominations are now open for 2019’s Most Innovative Engineers list. To nominate yourself or someone you know, click here. Michelle is a science and technology journalist, which makes perfect sense given where you're reading this. Her work has seen her drive to the remote SKA site in a 2WD Hyundai, test great white shark detectors in a tinny, visit a tiger snake-infested island dubbed the most dangerous in the world and meet isolated tribes in the jungle.